I have a young dog that has been limping for several days. What can cause this? There are many causes of limping and lameness in young dogs. Most of these are relatively minor and resolve without medical or surgical intervention. However, there are other causes that are more serious and, if not treated promptly, may result in permanent lameness or lead to debilitating arthritis. The large breeds of dogs (typically dogs whose adult weight is over sixty pounds) have several bone diseases that occur during the period of rapid growth (up to two years of age). "Your veterinarian will recommend diagnostic testing if lameness lasts more than 2 weeks." x-rays examined by a veterinary radiologist. What skeletal diseases are more common in a young dog? "Osteochondritis dissecans (OD or OCD) is a defect on the smooth cartilage surface." Osteochondritis dissecans (OD or OCD) is a defect on the smooth cartilage surface within one or more joints. The term osteochondrosis refers is an abnormal development of the cartilage on the end of a bone in the joint, while osteochondritis dissecans refers to a separation of the diseased cartilage from the underlying bone. It most commonly affects the shoulder joint but the elbow, hip, or knee (stifle) may also be involved. In some cases, the defect is either a flap of cartilage or a crack in the cartilage on the end of the bone; if this occurs, the defect may heal with strict rest and restriction of activity for several weeks. 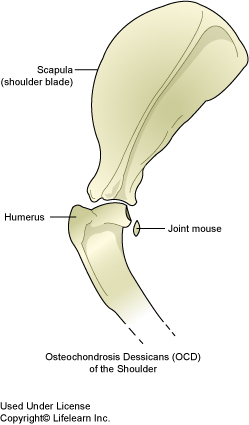 In other case, a piece of cartilage breaks off and floats freely in the joint (sometimes called a "joint mouse"). This causes pain, which varies from mild, intermittent limping to intense, constant pain. Surgery to remove the defective flap or "floating" piece of cartilage is the recommended treatment in these cases. For further information on this condition, see our handout "Osteochondritis Dissecans". Panosteitis is an inflammation on the surface of the long bones. This is also called "long bone pain" or "growing pains." This may occur in more than one bone at a time and may cause a "shifting" lameness that goes from one bone or leg to another. It is self-limiting but may recur until rapid growth is over. The pain may be relieved with several types of medication. This is perhaps the most common cause of "shifting-leg lameness" in young, fast-growing dogs. A common clinical sign is pain when the long bones are squeezed and inflammation, including intermittent heat, above the affected site. For further information on this condition, see our handout "Panosteitis in Dogs". Elbow Dysplasia is an abnormal growth or development in the elbow joint. 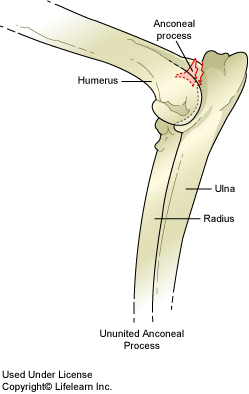 The elbow joint is made up of 3 bones, the radius, the ulna, and the humerus. "Three different problems can cause elbow dysplasia - an ununited anconeal process (UAP), a fragmented coronoid process (FCP), or osteochondritis dissecans (OCD)." Three different problems can cause elbow dysplasia - an ununited anconeal process (UAP), a fragmented coronoid process (FCP), or osteochondritis dissecans (OCD). UAP is a developmental defect of the anconeal process. The anconeal process is a small piece of bone that is found on the back of the ulna (the longer of the two bones of the forearm) at the rear point of the elbow. Normally, as the dog reaches puberty, the growth plate that is found between the anconeal process and the rest of the ulna closes, fusing the parts of the bone together. When this part of the ulna does not fuse, the elbow joint becomes unstable, causing lameness and pain, and quickly develops degenerative joint disease or arthritis. In some cases, the bone fragment floats freely in the joint, causing further discomfort. Dogs with this disease are lame on the affected leg or legs and they may cry when the elbow is extended. Treatment requires surgery. The results are much better if surgery is done before secondary arthritis affects the joint. FCP is a developmental defect of one of the coronoid processes, two small bony protrusions on the end of the ulna, within the elbow joint. In this condition, either the medial or lateral coronoid process develops a fissure or crack and separates from the rest of the bone. This causes pain and joint instability. Unless surgery is done immediately, arthritis will develop in the joint. This condition is likely hereditary and occurs more frequently in large breed dogs, especially the retriever, Rottweiler, and German shepherd. For further information on each of the types of elbow dysplasia, see the appropriate handout. "Hip Dysplasia is an improper formation of the hip joint." Hip Dysplasia is an improper formation of the hip joint(s). The hip joint is a "ball and socket" joint. During growth, both the "ball" (head of the femur) and the "socket" (acetabulum) must grow at equal rates. "Dysplasia" simply means abnormal development or growth, and with hip dysplasia, this uniform growth does not occur. The result is that the ball and socket do not articulate or fit together properly, resulting in laxity or looseness. The hips become "out of place" resulting in pain, lameness and limping. Hip dysplasia has a hereditary component to it, and is much more common in large-breed dogs such as golden retrievers, Labrador retrievers, mastiffs, German shepherds, Rottweilers, Old English sheepdogs, etc. To decrease the incidence of hip dysplasia in future generations, no dog that is in a high-risk breed should be bred until radiographs of its hips have been taken. Recent research suggests that the type of diet and/or the calcium level of the diet that the puppy is eating during this rapid growth phase is a risk factor for developing hip dysplasia. Therefore, veterinarians advise that large breed puppies should eat a special large-breed puppy food for at least their first year of life. Be sure to consult with your veterinarian about what you should feed your puppy during this critical period. Dogs with severe hip dysplasia have great difficulty going from a lying to a standing position and are in pain when they walk, while dogs with mild hip dysplasia may show no signs of lameness. However, as the dog ages, they generally develop secondary arthritis and associated pain and reduced mobility. There are several choices of treatment depending on the severity of hip dysplasia. Some dogs can be treated with medication while others will require surgery. (for further information, see the handout "Hip Dysplasia"). Luxating Patella is a condition that affects the knee. The patella, or kneecap, is attached to the inner surface of the patellar ligament. It sits over the middle of the knee joint and glides back and forth in the trochlear groove. 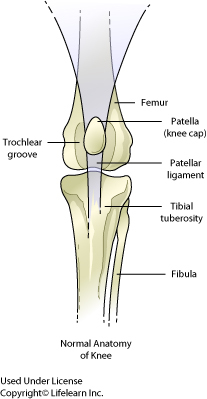 A luxating patella pops out of its groove and moves to one side or the other when the knee is extended. This happens either because the patellar ligament is not attached properly on the midline of the tibia (common in 'bowlegged' dogs), or because the trochlear groove is too shallow. There are several grades of patellar luxation, from an occasional luxation to a state of permanent luxation. The severity may worsen over time and often becomes noticeable as the dog matures. When the kneecap luxates the knee cannot move normally. Dogs with this condition may learn how to 'hyperextend' the knee joint and snap the patella back into place. Luxating patella is more common in small breeds of dogs, and appears to have a hereditary component. This condition requires surgical correction. For further information, see the handout "Luxating Patella".